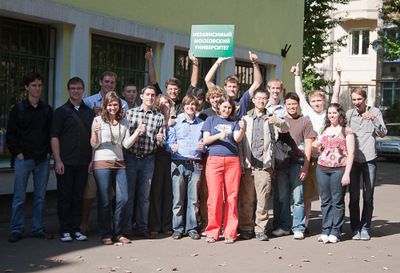 The Math in Moscow program has been an amazing experience that I will never forget. The classes I have taken have been some of the best math courses I been in. Also living in the great city of Moscow has been a great cultural experience. I am hoping to be able to come back in a few years to study in the Math in Moscow program. Math in Moscow has been one of the most rewarding experiences in my life. To study in such close-knit group and among such talented people has done for me what years of math in U.S. universities couldn’t, I’m proud to say I got a chance to study here. This program intrigued me since the time I first heard about it. I knew as a freshmen that to study mathematics in Russia would be an essential part of my experience. I can now say, having completed a semester at the program, that every aspect of my experience lived up to my expectations. I think that the university that has been set up has an admirable and noble mission to serve the most talented mathematics students and I pleased that it opens its doors to both those students and those ambitious to become one of them. It was an incomparable time and has offered me extensive mathematical and personal development. The IUM classes are uniquely tuned the personality of the professor and I look forward to opening myself to more of these in the coming year. The time I spent in Moscow is an unexpected treasure in my life. Here I made great friends and went to lots of museums, galleries, theaters with them. The Russian students here I met are most amazing. And through them I feel the spirit of the city. The classes here are also impressive with a math higher average difficulty and intensity than their counterparts. I can’t wait for the next semester in Moscow which ‘ll happen after the break. I had a great time exploring Moscow and learning mathematics here. The professors were all very dedicated and I enjoyed the super small class sizes. I’m disappointed the weather didn’t get as cold as I wanted, but this last week has been alright. Looking back on my decision to come to the program I have no regrets at all. Thank you for the unique experience. Math in Moscow is an extremely challenging program and is not for everyone. It will probably be the most difficult academic experience you will have as an undergraduate. With that said, if you want to take a risk and truly test your abilities, this program could be exactly what you are seeking. Math in Moscow will also provide you with a cornucopia of opportunities to experience Russian and Eastern European culture. I highly recommend visiting Saint Petersburg and the ancient cities of Vladimir and Suzdal, as well as taking weekend trips to the Ukraine, Finland, Latvia, and Belarus.